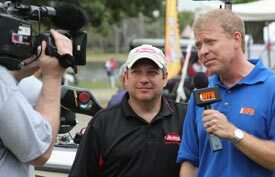 The first episode of the 2011 Bass Champs Television show will air Monday, April 11 at 8:30 PM Central on The World Fishing Network. The first show will feature the 2010 Skeeter Owners Tournament on Lake Fork. The Skeeter Owners tournament is the largest "owners" tournament in the world. Be sure and tune in or set your DVR's and see some huge Lake Fork Lunkers brought to the scales by anglers from all over the country. Bass Champs President, Chad Potts stated, "I have no doubt this is going to be the best season of Bass Champs TV ever. We filmed tournaments on some of the best lakes in the world, and our camera crews captured some amazing footage." Potts continued, "Our viewers will get to see unique winning strategies from anglers that will most definitely help them in their own tournament ventures, plus viewers will get to see a lot more "behind the scene" footage. I'm excited for all the shows to air and to hear the feedback from anglers." New Bass Champs TV episodes will air Monday nights at 8:30 Central, and will re-air additional times during the week.